When I was at Woodfield Mall about two months ago, I stopped by the Guest Services Desk and asked the staff if they knew which restaurants and stores had been in the mall the longest. The mall opened in September 1971 with Marshall Fields and Sears as the first two anchors. J C Penney opened in October and Lord & Taylor opened two years later in 1973. But, outside of the anchors, what were the oldest establishments? Were there any that have been continuously operating since the mall opened? 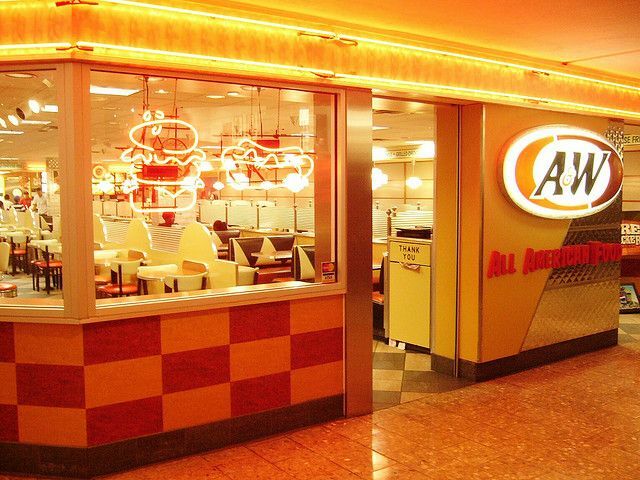 We batted it around a bit and surmised that the longest running restaurants were A&W, McDonald’s and Sbarro Pizza. Struggling to come up with the longest running stores, we could only think of Eddie Bauer as a possibility. Then, a light bulb went on and the staffer thought it might be some of the jewelry stores. With that, I had something to start with. 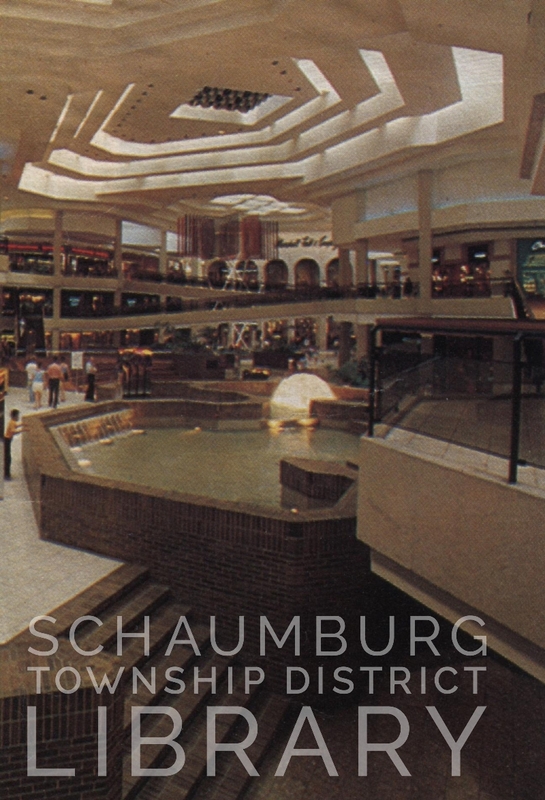 To research the question, I took a look at the list of stores on Woodfield’s website and compared it to the 1982 Schaumburg phone book, which is the oldest in our collection. I then checked these against the 1971 Daily Herald to see if any of them were mentioned in articles, ads or classified ads. Lo and behold four of them were here in either September or October of 1971. Think about it, Woodfield Mall is two years shy of celebrating its 50th birthday and, outside of the anchors, three stores have been in business for the entire duration. Imagine the number of customers who’ve gone through their doors, the number of times they’ve changed locations, renovated their stores and how many employees from Schaumburg Township worked for these retailers. What an amazing run they’ve had! Do you remember the aquariums at Woodfield? The tanks that were at Center Court in a tunnel beneath the fountain? Can you remember the music that was piped into those tunnels? At the time, Ms. Ciani was getting started in a new field of music. It centered around a synthesizer called a Buchla which was developed by Donald Buchla in the early 1960s. It was a 160-pound instrument composed of panels, wires, buttons, knobs and a piano-like keyboard that could be used to both create new sounds or mimic such sounds as leaves rustling, water flowing or a snake hissing. Ms. Ciani recalls that Tamara Thomas was the art subcontractor who approached her about the aquariums. Ms. Thomas primarily represented sculptors and, according to her 2004 obituary in the LA Times, “established herself in New York in the late 1960s, building an art collection for shopping center mogul Alfred Taubman and installing artworks in his properties.” As it turns out, Mr. Taubman was the developer and long-time owner of Woodfield Mall. Ms. Thomas found her through two sculptors both women worked with–Harold Paris and Ronald Mallory. Mr. Paris likely mentioned Ms. Ciani, as his house was next door to Donald Buchla’s studio in Berkeley, California. 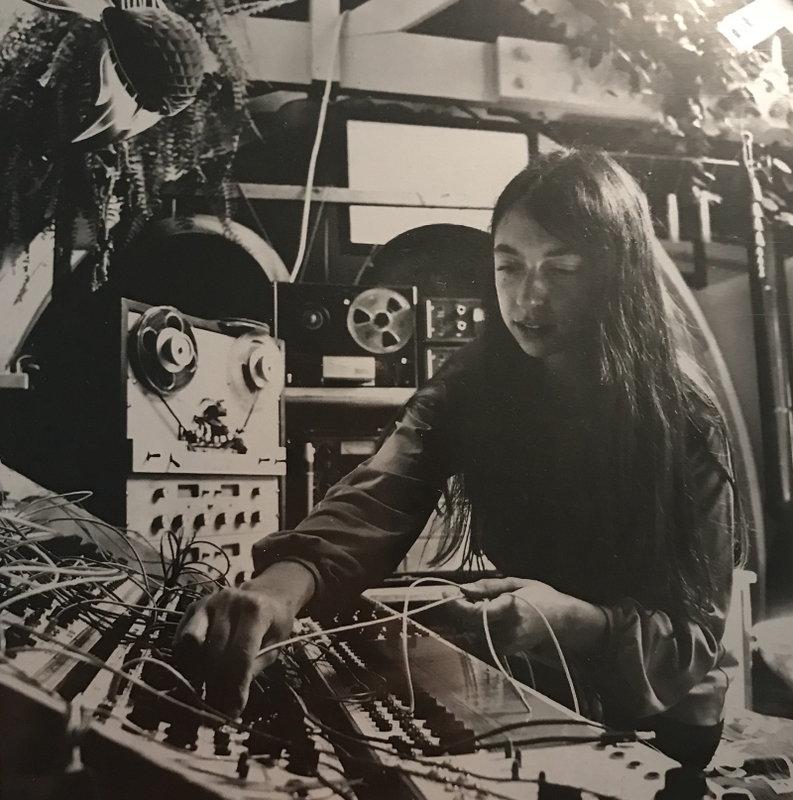 Using the Buchla at his studio, Ms. Ciani created a unique composition for Woodfield that was designed to musically mimic the exotic fish swimming in the aquariums. 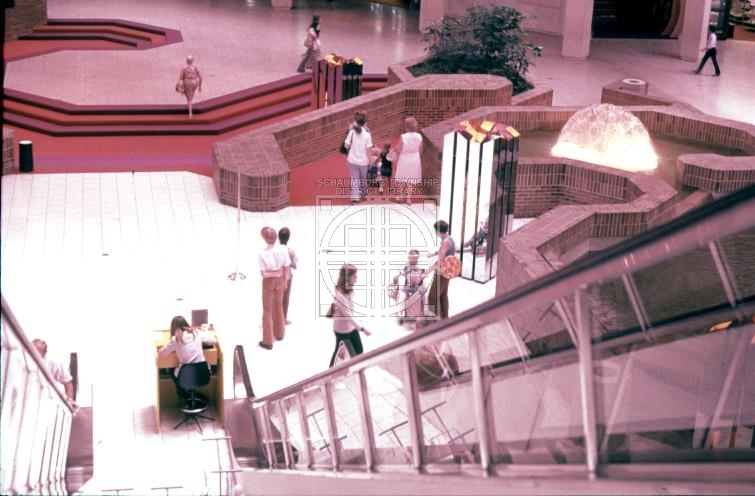 It was an unusual idea and a distinctive addition to a mall that, when it opened in September 1971, was the largest indoor shopping center in the United States. As a subtle pleasure, the underwater sounds of Ms. Ciani’s music played in a continuous loop for visitors who explored the tunnel and the aquariums. Her contribution was nothing less than first class. You can listen to a portion of it here. The fountains, the waterfall and the aquariums remained in place until about 2004, when they were removed from the mall. The Woodfield “Fish Music” however, was only the beginning for Ms. Ciani. Take a listen to this tidbit from a documentary called “A Life in Waves” in which Ms. Ciani adds her unique touch to a Coca Cola commercial. Or, you’ll definitely recognize this creation that she did for AT&T. 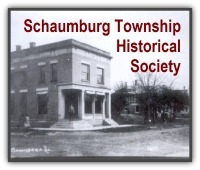 It sounds even more memorable now that you know who did it–and that she, too, is part of Schaumburg Township’s history. My thanks to Suzanne Ciani for her input with this blog posting as well as her contribution of the photo. She was very gracious in providing information and, between us, we managed to uncover the connection linking her, Tamara Thomas and Alfred Taubman. Thank goodness, she remembered Ms. Thomas’ first name–it was a wonderful find! 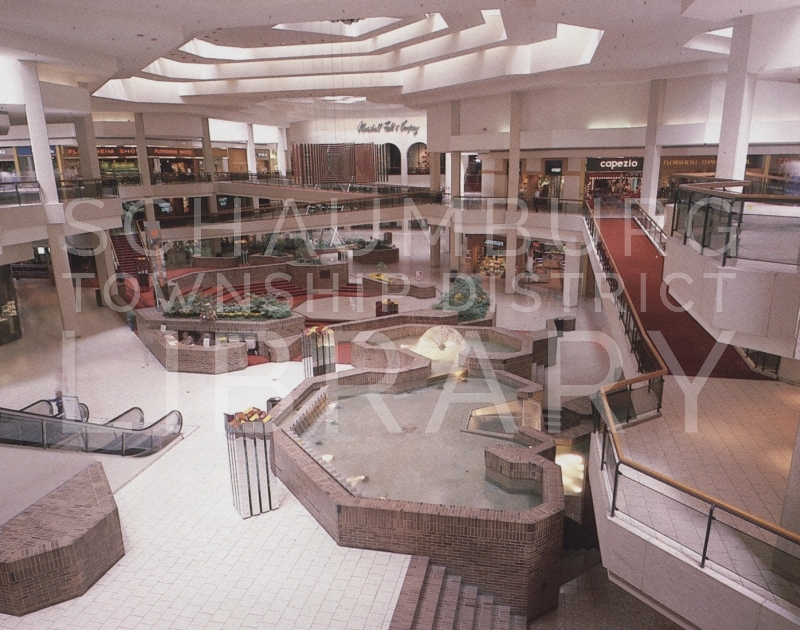 The upper photo of Woodfield Mall was used courtesy of the former Profile Publications of Crystal Lake. The lower photo is from Chicago Magazine. Are you interested in a few more photos of opening day at Woodfield? How about football practice at Schaumburg High School from 1971? Well, the Daily Herald opened up their archives and allowed us to take a look at a selection of local photos. Check them out here. 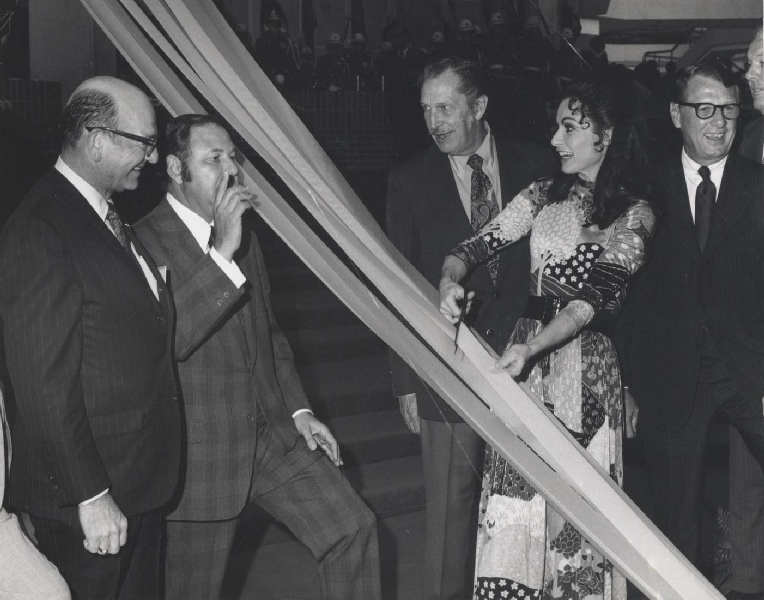 The Woodfield photos are largely of celebrities Carol Lawrence and Vincent Price who were on hand for the festivities on September 9, 1971. The first photo shows the two of them surrounded by other dignitaries that included Mayor Bob Atcher, first from the left in the photo above, and Al Taubman who is second from the left and was the developer of the mall. Vincent Price was on hand because Sears Roebuck & Co. had recruited him to lead an affordable art program that they had implemented for the public. Price was an art collector himself and purchased much of the art that Sears sold and even commissioned artists such as Salvador Dali to create art for the program. If you’d like to read more about Mr. Price’s involvement with Sears, check out that blog posting. But, why was Carol Lawrence there? The best we could figure is that, not only was she from the Chicago area, having been born in Melrose Park, but she and her husband, Robert Goulet, were also performing at the Mill Run Theater in Niles the following week from September 13-19. Would there have been another reason they tapped her? Notice all of the people in the background. These could be local residents, future employees and/or construction workers. Woodfield was not completely finished on opening day so anyone and everyone who was around would have been interested in taking a look at the celebration. To read more about Woodfield Mall’s opening day, check out this blog posting. Or, if you’re interested in what was there before Woodfield, check out this blog posting. As for the football photos, you can find them at the bottom of the page. 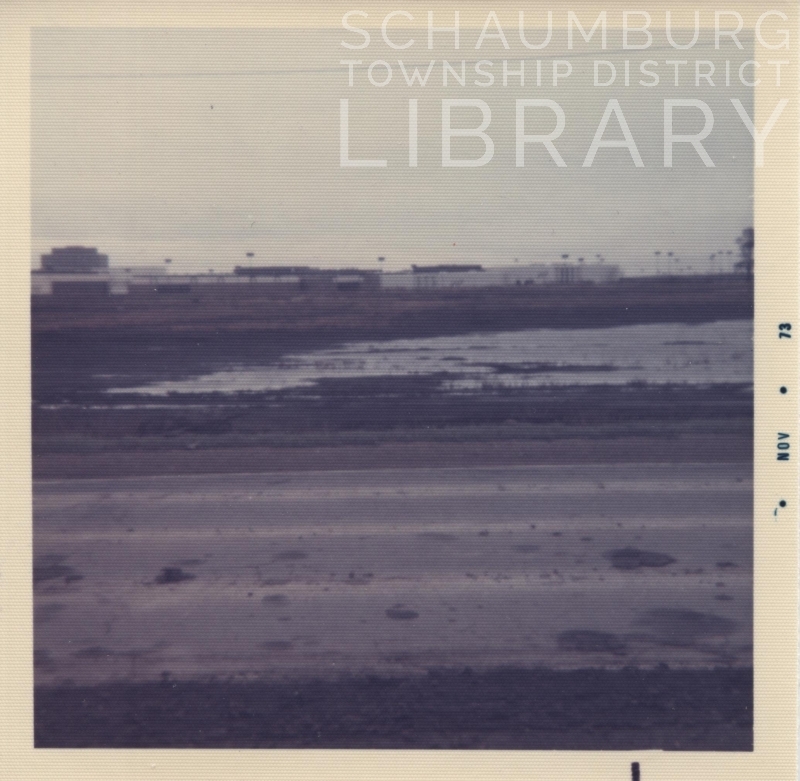 Schaumburg High School had opened the prior year in 1970 and it is evident in the photos. Not only are there open spaces as far as the eye can see, but there is also no foliage–tree, bush or otherwise–that had yet to be planted around the building. If you were part of that photo or were one of those first SHS students, please let us know if there’s anything we’re missing in these photos. Local history is always enhanced when older photos become available. Not only do they trigger memories but they help fill in the gaps in our history. A big thank you to the Daily Herald for sharing them with us! The world of Woodfield Mall is of never ending interest to those who lived nearby and grew up here. For them, it was a place to shop. It was a place to work. It was a place to see concerts or get a glimpse of someone famous. It was a place to hang out. And it was a place to see and be seen. But, it was also a place to eat. 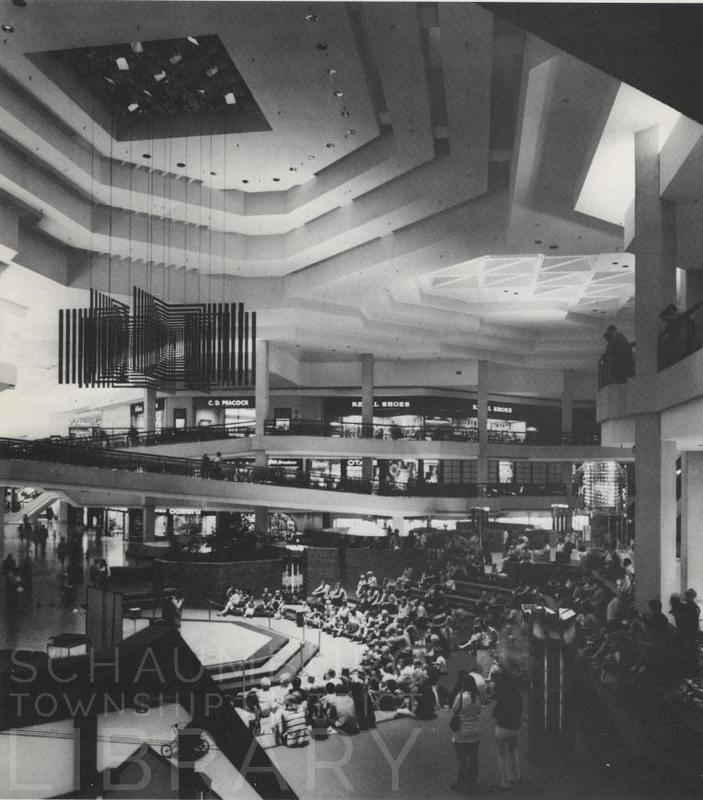 Woodfield was unique in that it never had a food court. That didn’t mean, though, that they were ever hurting for dining options. 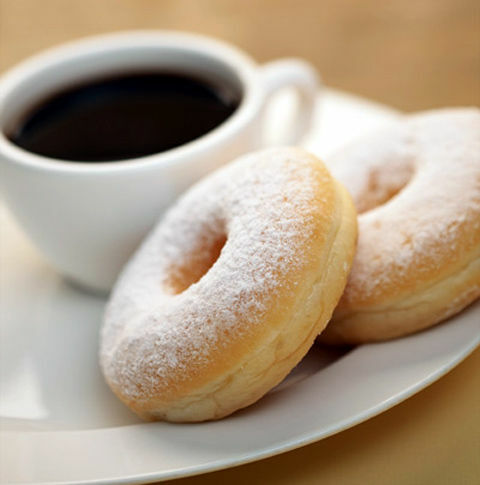 In the beginning, some of the restaurants were chains and some were independently owned. Some lasted for years and some were gone rather quickly. They all had their day in the sun and they all had their followers. Ask anyone who frequented the mall and they’ll tell you right away which one(s) were their favorite(s). So, please mention your favorites, which ones you worked at and which ones we’re missing. 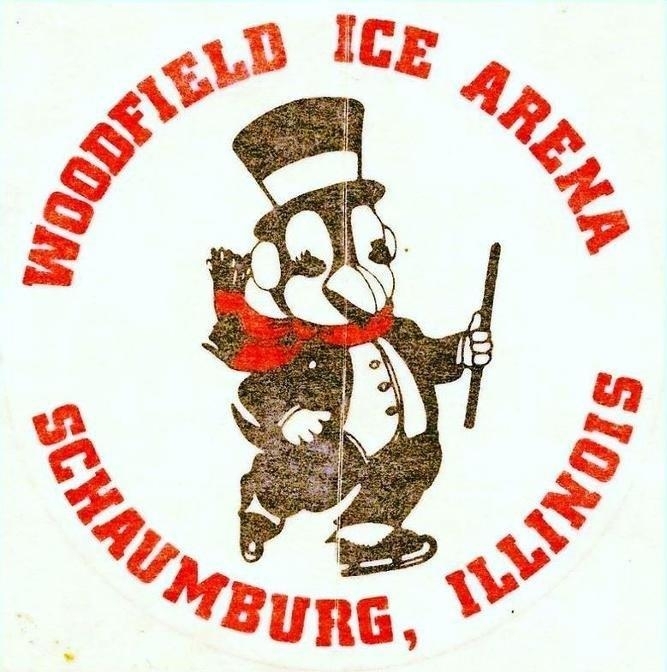 The list below was compiled from Woodfield’s website, various Woodfield directories, firsthand knowledge and mentions from other blog postings. With your help we’ll get it as complete as possible. And, of course, if you would like to share any photos, I’d love to create another blog posting around some of the individual restaurants. The only one I’ve ever done is on International Park because some of the commenters supplied me with photos. Jump in if you can and pass them on to me at the email address below. The photo was used courtesy of the former Profile Publications of Crystal Lake. Let’s get even more local and take a look at these Woodfield and Schaumburg commercials on Fuzzy Memories TV. They’re brought to you by The Museum of Classic Chicago Television. If you go to the website and put “Woodfield” in the Keyword Search box at the top of the page, you’ll find commercials for Woodfield Mall itself, the Pepsi challenge at Woodfield Mall, Hollands Jewelers, and Pet World. And don’t miss the Homemakers commercial done by actress Shelley Long before her Cheers career began! 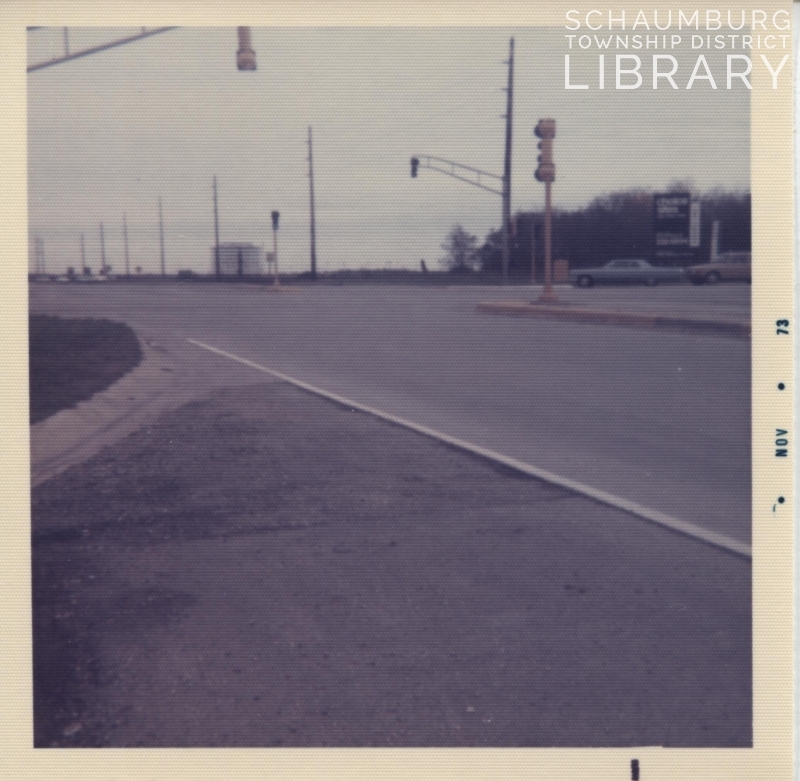 If you change your search to “Schaumburg” you can see some of the same spots mentioned, but there’s also an ad for La Margarita that was on Algonquin Road and Schaumburg Datsun that was, of course, on Golf Road. Other commercials for companies like Sportmart and Steven’s Bedding are unique to their brand but mention their locations in Schaumburg at the end. It’s a pretty neat walk back in time to the 1970s. Does anyone know or remember the people on the Pepsi Challenge? WHAT WAS THERE BEFORE WOODFIELD? I get asked that question a lot. 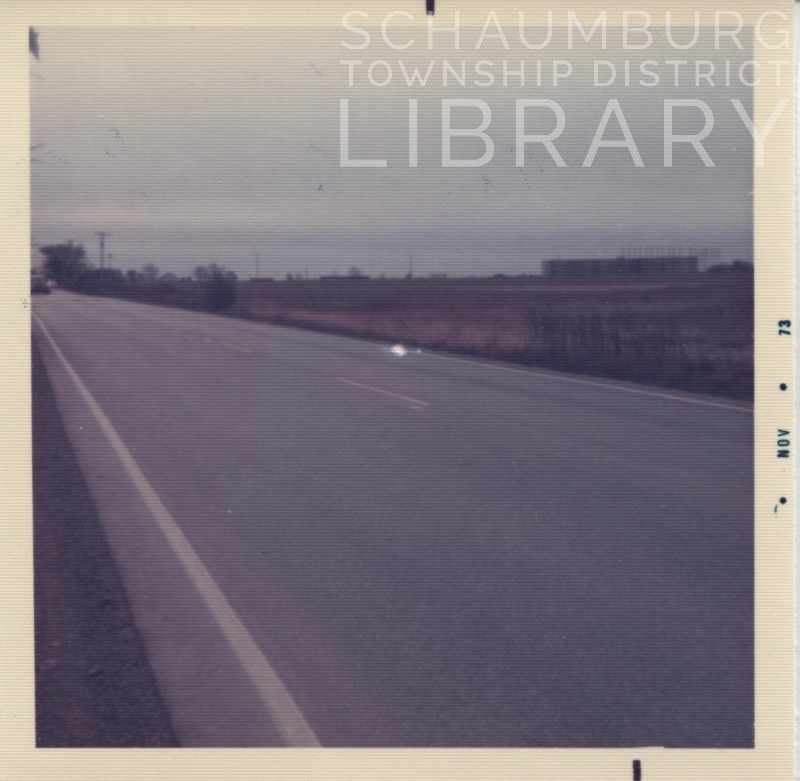 And now, through the generosity of Richard Frank, a frequent reader of the blog, we are able to see for ourselves what the eastern edge of Schaumburg Township looked like before Woodfield Mall rose from the ground. The photos belonged to his father who found them in a desk drawer when he worked for Sears. It took some time to figure out what he was looking at but, once he did, he hung onto them. Sensing their historical value, Richard was kind enough to donate them to the library. These aerial photos were taken on September 26, 1969 by Airpix, which was based on North Laramie in Chicago at the time. We have to assume that the developers of Woodfield hired Airpix to take the photos just as development of the mall was beginning. The views are from four different angles so it’s possible to get a 360-degree sense of the area. This first photo looks towards the southwest at the large Woodfield plot. Off to the left of the property, we can see several trucks gathered near the long diagonal, dirt road that stretches to the middle of the plot. It appears that the construction trailer for the project is far to the right, along Golf Road. While it’s impressive to see the enormous scale of the project, it’s just as interesting to see what skirts the property. Note Route 53 in the foreground of the photo–or Rohlwing Road–as it was often called at the time. A cloverleaf is in place to allow traffic flow from two-lane Golf Road to merge onto 53. Having seen other earlier, aerial photos, I believe this cloverleaf was relatively new at the time. It was clearly designed around the four lane bridge that goes over Golf Road. Another interesting point is that there seems to be a rise in Golf Road just west of the cloverleaf. Does anyone remember this before Golf Road was graded to a more flat terrain? It is hard not to notice the farm in the foreground with its large white barn. It is the Rohlwing farm. The family, in fact, sold a portion of their property for the Woodfield development. The home place on the east side of Route 53 was eventually sold to the Cook County Forest Preserve. The barn was used for years as a maintenance location and was only torn down within the past decade. The subdivision of Lexington Fields Estates in the background of the photo was begun in in the late 1950s and is obviously flourishing. The trees are well established and there is easy access to the four-lane Higgins Road that runs adjacent to the subdivision. This photo looks due south so we get a good view of the Woodfield site and Lexington Fields Estates. Again, it’s a good idea to look at the periphery and catch a few things that become more obvious with a different perspective. First of all, it’s possible to see that there IS a slight rise in Golf Road on the eastward approach to Route 53. We can also tell that Route 53 is a two lane road to the south of its intersection with Golf. And, take a look at that jog Route 53 takes a bit south of the Golf Road cloverleaf. Frankly, in looking at that area around Higgins Road, it’s pretty clear that work had already begun on a clover leaf at that intersection too. 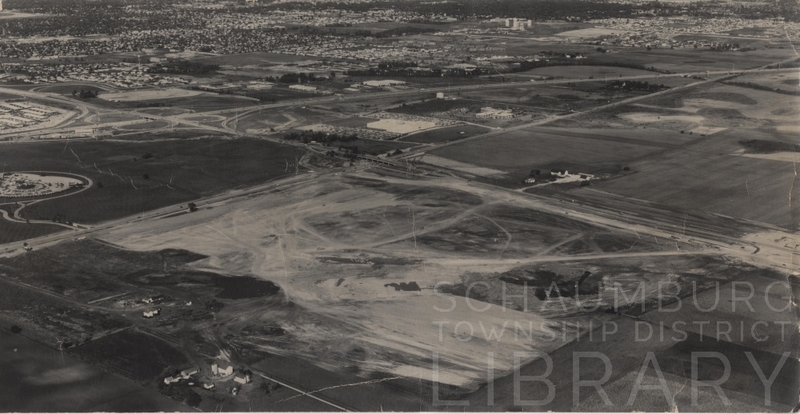 We can see in this view that the main construction facility–for possibly both the mall and the roads–was on that curve and not in the trailer along Golf Road. So, when the village fathers got started with Woodfield, they also started planning for the infrastructure that would make getting there much more feasible. Isn’t it interesting to look further south on Route 53 and note a couple of roads intersecting with just a simple stop sign? Imagine that today! Also, note the big pond in the upper left of the photo and the smaller pond just beyond it. 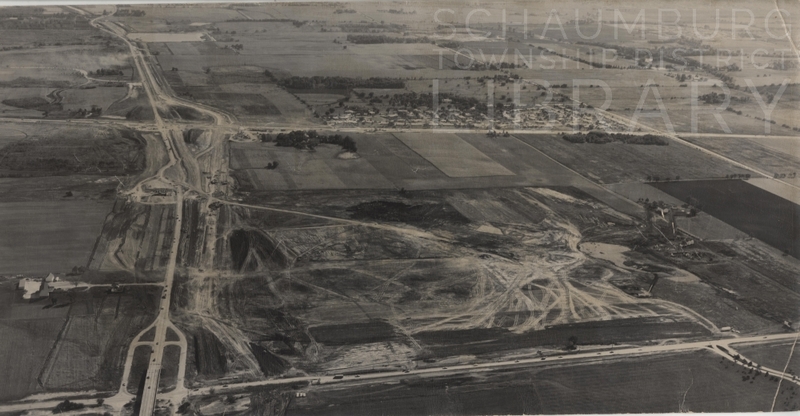 Those are the former gravel quarries at the L.A. Scharringhausen Material Co. They are now part of the Metropolitan Water Reclamation District property. 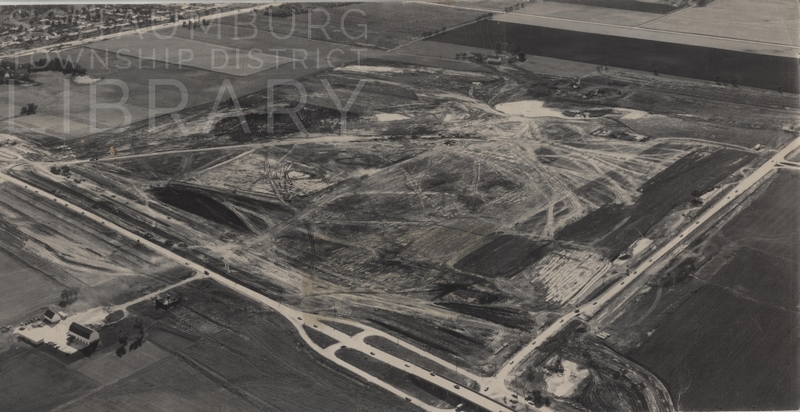 The quarries began operation in the early 1950s under Scharringhausen. Note, too, the many small groves of trees that are in the area. The larger grove in the right background of the photo is today’s Spring Valley. It was owned by Frank Merkle in 1969 and was even then a beautiful oasis in an arena of fields. This view looking northeast gives us a completely different, more suburban perspective. We can see Arlington Heights and Rolling Meadows in the background. The Northwest Tollway (I-90) intersects the middle of the entire photo with the much larger cloverleaf at Route 53 clearly visible. The Kassuba Trace apartments–later called Woodfield Garden–nestled in the northwest corner of the Northwest Tollway and Route 53, are visible as is the round parking lot of Pure Oil just below. To the east of Route 53 is the all concrete Western Electric building in Rolling Meadows. This building was later renovated by 3Com in 1998 and is now the Atrium Corporate Center. To the right of Western Electric is the former Chemplex / Quantum Chemical Company / Helene Curtis / Unilever building that was purchased by Weichai America around 2012. It was newly built when this photo was taken in 1969. In the very middle background are the radomes on Central Road in Arlington Heights across from the relatively new Northwest Community Hospital. These were used at the time as part of the Nike Ground to Air missile defense system with underground missiles in bunkers at that location. This is a similar view with a more westerly slant. The plane was a bit higher and further east so it gives us a greater perspective of northwestern suburbia. We get a wonderful view of the magnificent Pure Oil property with its unique, circular parking lots. Compare those lots to the regular, square parking lots of AT&T and Chemplex. They are a combination of whimsy and futuristic design. Also more visible are the many apartments in the Woodfield Garden complex. Across Route 53 is the site of the future Rolling Meadows Holiday Inn. The hotel is in the same state of construction as the Woodfield site and opened in 1970. If you look further back in the center of the photo you can see the round oval of the Arlington Race Track. To the left of the track is the multi-story Arlington Hilton. You can also see the big curve Route 53 takes going north. If you spot something else I haven’t seen, please let me know. I’m happy to add the details. And, let’s once again thank the Franks for keeping these marvelous photos for so many years. In addition, we must thank Barbara Perricone, President of the former Airpix company for granting permission to share these photos. It all rolled into a wonderful opportunity to view our area’s history from the air. In the summers of 1977 and 1978 Steven Wilson was a young man working at McDonalds in Woodfield Mall. It was a seasonal job and, in his spare time, he indulged his appreciation of the architecture of the mall with his recent interest in 35mm photography. With Mr. Wilson’s permission it is a pleasure to share some of his photos with the blog’s readers. You can view the photos on his Flickr account and see the grandeur of Woodfield Mall’s Center Court during that time. Take note of the iconic piece of art that hung from the ceiling over Center Court. It has been gone for a while but the colors obviously worked with those of the carpeting. 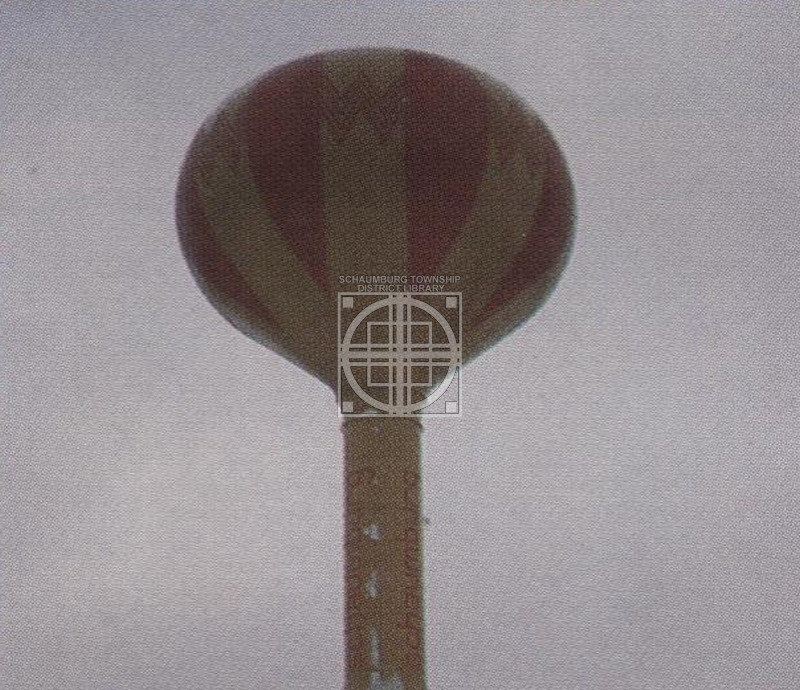 The same colors and elements of the design were also thematically reflected in the Woodfield Water Tower. It was obviously a planned theme. Also interesting to note are the geometric themes carried out in the sunken stage, the ceiling and the art work. And, of course, you get a good view of the fountain, the crosswalks and the double escalators. As far as stores go, I see Holland Jewelers, Johnson & Murphy shoes and Regal Shoes. Do you spot any other stores that you recognize? What, for instance, is the store next to Holland? Or the store that has rainbow colors to the right of Johnson & Murphy? If you can help with any names, it would be appreciated. Many thanks to Mr. Wilson, author of the soon-to-be published Six Flags Great America, for these great photos. We are fortunate he picked up a photography hobby at the same time he was making Big Macs and french fries! 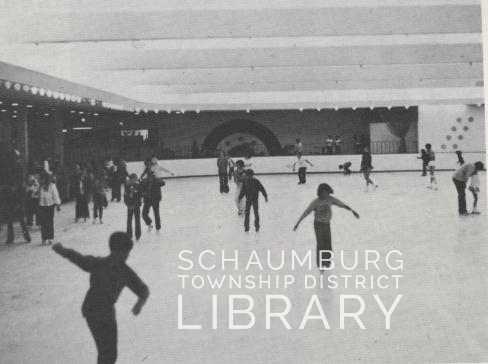 Last fall the Schaumburg Township Historical Society received a phone call from the Arnold family about a collection of photos they took in the early 1970s. 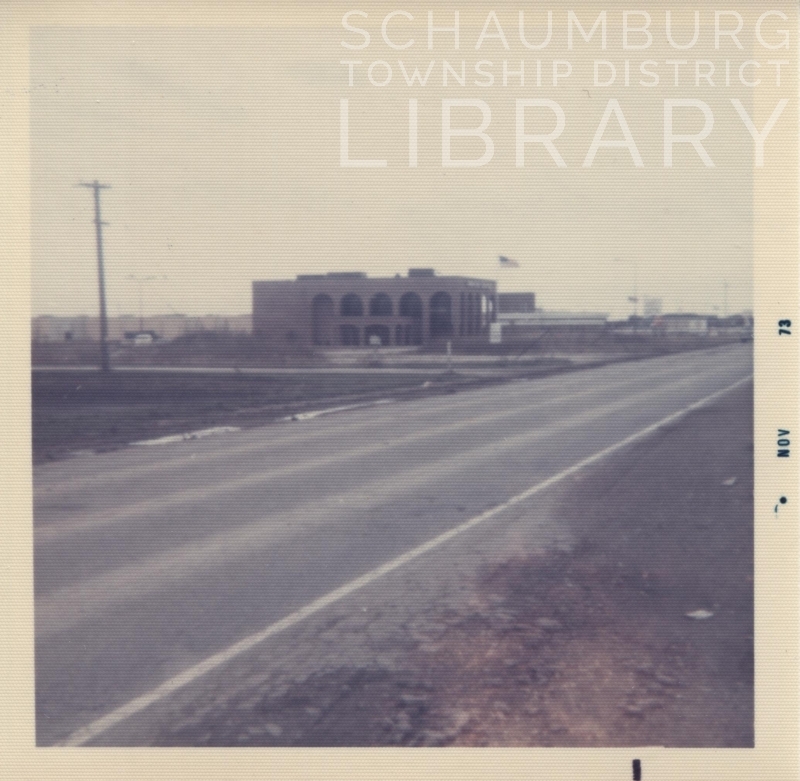 The pictures of early Schaumburg had sat in a drawer for the past forty years and they were hoping to pass them on to someone who might be interested. The Historical Society gladly accepted the photos and then kindly donated them to the library to add to our Local History Collection. The story of these photos begins in 1971 when the Arnold family moved to Schaumburg from southern California. 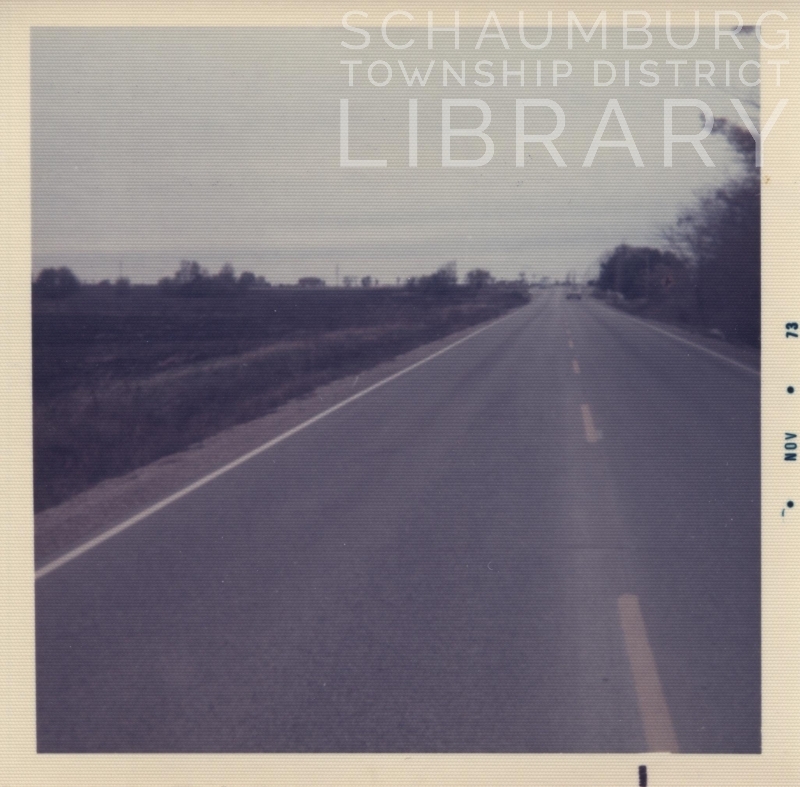 They were surprised at the amount of open space in Schaumburg Township still occupied by farm fields and undeveloped acreage. Mrs. Arnold said, “We were amazed at all the open field but knew that wouldn’t last long. 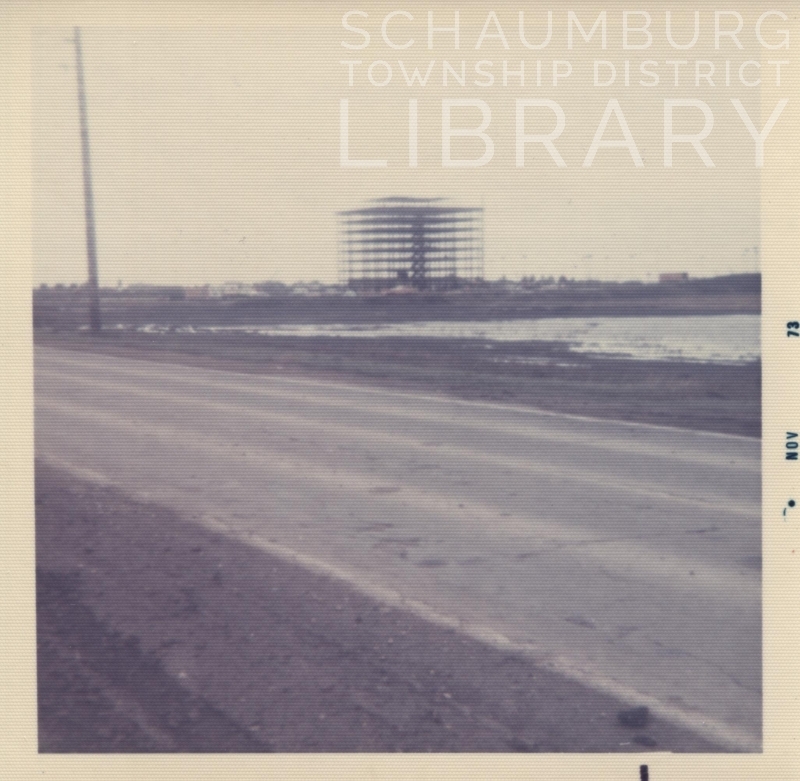 I decided to take pictures of the ‘before’ of Schaumburg.” She then began to drive the roads of Schaumburg, taking photos of various buildings and intersections. One of the areas that Mrs. Arnold photographed was of Meacham, Golf and Higgins Road. Below are a few of those photos. Meacham Road between Golf and Higgins—looking east towards the Woodfield area. The year is 1973. Woodfield Mall, in the background, opened two years ago in 1971 along with the water tower that was necessary for the mall’s development. The distinctive orange and yellow globe is sitting by itself with the skeleton of one of the first multi-story office buildings near it. Two cranes loom over the structure and appear to dwarf the trees to their left. Notice that the road is two lanes and has suffered through the winter. Looking southwest on Meacham with the Bar Harbor Condominiums in the background. The first condos of the area were begun in 1971 and were originally designed as four ten-story buildings, later scaled down to five seven and eight-story buildings and eventually opened in 1972 as two five-story buildings. They were developed by Elmer Gleich. Looking northeast at the corner of Meacham and Higgins. The photographer is on Meacham Road, looking through the crossing at Higgins Road. The intersection has clearly been widened in anticipation of both Woodfield Mall and the development that is to come. There is traffic but it is certainly not overwhelming the intersection. Also, note the overhead power lines that are no longer in existence. Another skeletal office building is under development in the background and is the first of three office buildings that will be Woodfield Park Office Plaza. Looking south at Meacham Road between Golf & Higgins Road. 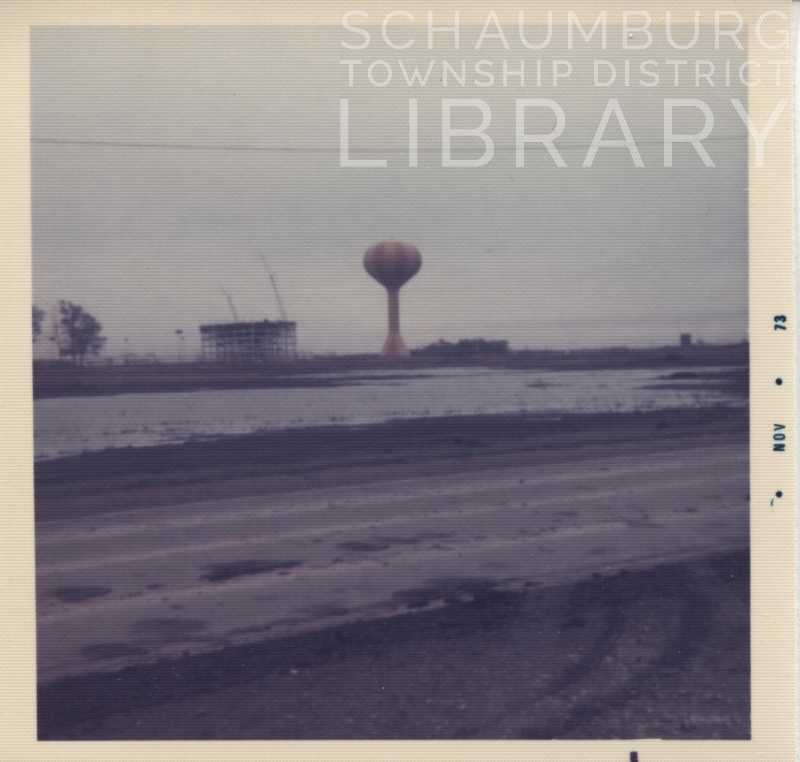 This a rather bleak photo that exemplifies how much Schaumburg grew in the future. The roads are empty and in need of repair. Utility poles line the road. A few trees dot the horizon and the area seems to already have been set aside for commercial and business development. Meacham Road between Golf and Higgins Road. Woodfield Mall can be seen in the distance–with nothing around it. The brown brick of the J C Penney wing is to the left with the white brick of center court and the rest of the mall to the right. Meacham Road looking north between Golf and Higgins. 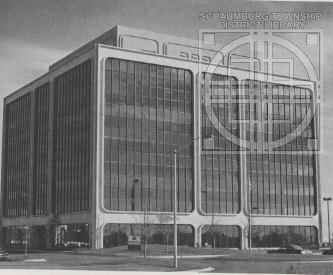 The American Savings Association building shown above opened on September 29, 1972 on the west side of Meacham Road. According to local architect Jeff Whyte, it is a nice example of the 1970s modernism style. It remained American Savings until Weber Grill bought the property. 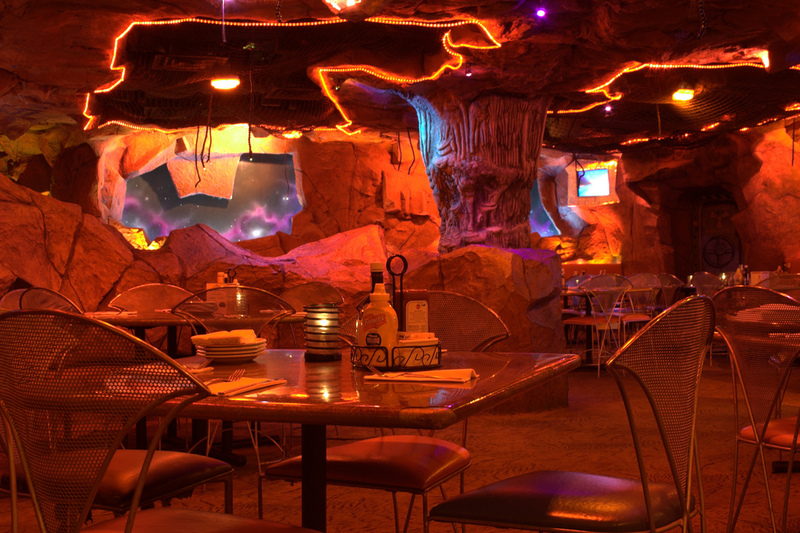 The building was demolished to make way for the restaurant that opened in 2005. The tan buildings in the background are that of the Woodfield Commons shopping center. Turn Style was one of their first anchors. Meacham Road looking northeast between Golf and Higgins. This is the first of the three Woodfield Park Office Plaza buildings. The owner and developer of the 385,000 square-foot complex was J. Emil Anderson & Son, Inc. of Des Plaines, IL. The three identical buildings that make up the plaza are “pre-cast concrete structures sheathed in dark reflective glass.” [Commercial Renovation: How to Acquire, Renovate, and Remarket Existing Properties by Matthew Kiell and John Casazza] The buildings were later renamed National Plaza at Woodfield. Below is a later photo of one of the completed buildings. Take a look at this photo from the collection of the University of Illinois at Chicago. It is a view of the first Plaza/Zurich Tower going up in 1985. You can see one of the completed Woodfield Park Office Plaza buildings as well as the American Savings Association edifice in the background. 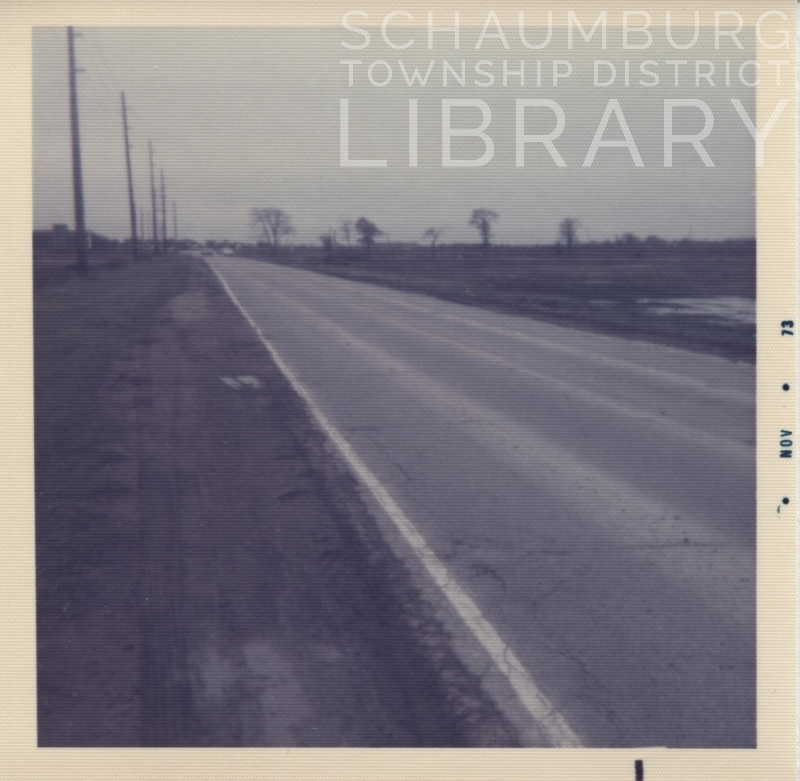 Looking north on Meacham Road between Willow and Schaumburg Roads. Again, the emptiness of the surroundings is very evident. 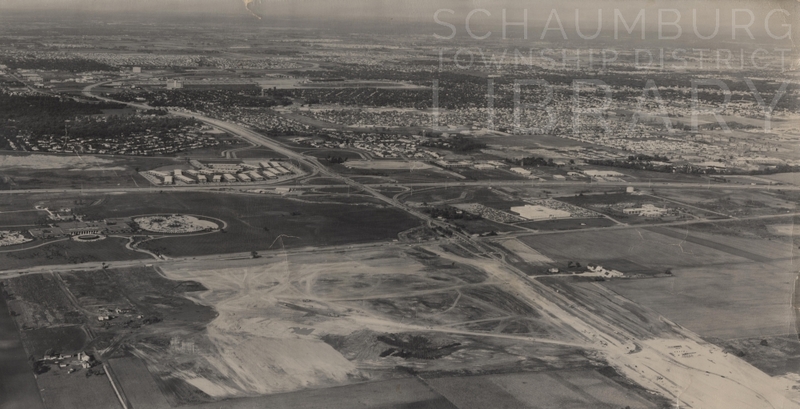 It certainly clarifies why the Arnolds were so intrigued with the huge swaths of vacant fields separating Woodfield Mall and the residential areas of Hoffman Estates and Schaumburg to the west. We know what the “after” of the greater Woodfield area looks like but, thanks to the Arnolds, we now have a good idea of what the “before” looks like too!